I heard it in my dreams, the same year everything seemed to come crashing down around me. It was the year of chemotherapy visits, of seeing watercolor bruises from the daily needles, of watching my dad shave the hair off my mother’s head. She was diagnosed that January with breast cancer. That diagnosis stamped the start of our new year, foreshadowing what the next few hundred days would hold. Weeks later, I had a dream. God spoke to me. I was halfway through sleep and consciousness when I heard the words: The year of no fear. I woke up right away. The voice had been so clear, so tangible — as if someone were cupping their hand around my ear and whispering to me. The year of no fear? Impossible. I rubbed my eyes and sat up. How could a year already marked by cancer be one that contained no fear? I pulled out my laptop and Googled, “verses about fear and courage”. Hundreds came up. Over and over and over again, God encouraged His people to be strong and have courage. There were days that year when I wasn’t courageous. Even in the midst of my year of no fear, there were some days I woke up afraid and trembling. And yet — even in my fear — God was the One who went with me. Who went with my mom. To every chemo visit, God went with my mom. To every doctor’s appointment, God went with my mom. During my year of no fear, I had to choose each day to believe those words. “You will not fail me or forsake me, God,” I prayed. And over and over, I clung to the promises He had made me. Through clinging to those promises, I began to become more courageous. I believe God is calling you to your own “Year of No Fear”. I believe 2019 is going to be the year where you tackle the places in your life that scare you — and at the end of 2019, you will look back and say, “I can see exactly where and how God made me braver.” Courage isn’t a feeling — it’s a choice. Choose to be brave. Show up to the things that scare you. God will give you the strength and the courage. Ask God for bravery. Find the plethora of verses in the Bible where God tells his people to have courage, and write some of them down on cue cards or sticky notes. Stick them on your car, on your bedside table, on your bathroom mirror, on your fridge, or on your laptop, so you can constantly be reminded that God is making you be brave. Read Annie Down’s devotional, 100 Days to Brave. Start a journal where you write down the steps of courage you are taking. You will be surprised when you read it back how much braver you have become. Hold tight to the promises God has given us. You were born to be courageous. Don’t let any lie tell you otherwise. This is your Year of No Fear. It is your year to grow into the courageous woman God has created you to be. You are not alone in your path of bravery. God is with you every single step of the way. He is the One who is making you courageous. Making resolutions this year? Let us help. Take DaySpring’s #LiveYourFaith quiz to find your 2019 Word of the Year - one word that will help you focus on what God is calling you to accomplish in the year ahead. Looking for more inspiration? 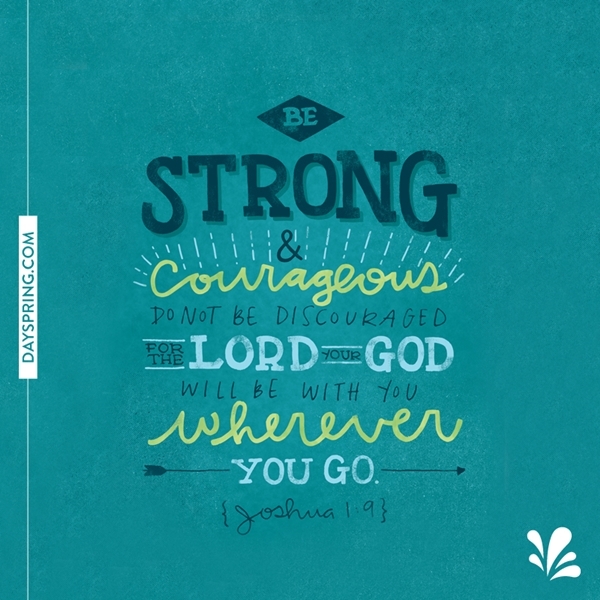 Check out our Courage Collection and our Devotional Library and be sure to sign up for our e-newsletter to receive free articles, updates from our Ecard Studio as well as exclusive deals. Show up to the things that scare you. God will give you the strength and the courage.